Happy Friday! So, I've showed you everything about the Pink Room but kept the Blue Room a suspense all this while, except for the special Nippon Momento wall which you can read about here. Yup, today's time for the BIG reveal on how this room looks like! Since I call it the Blue Room, you can probably guess that it's meant for the baby boy when he gets a little older. Yup, I guess that's the good thing about being the only boy of the family and having two sisters, who by the way actually love sharing their room. Anyway, since the baby still co-sleeps with me for now (and likely in the near future), this room functions as a playroom for now too. Some suggested to me that I should use this as a storeroom first since we don't have one in the house and no one sleeps here for now anyway. 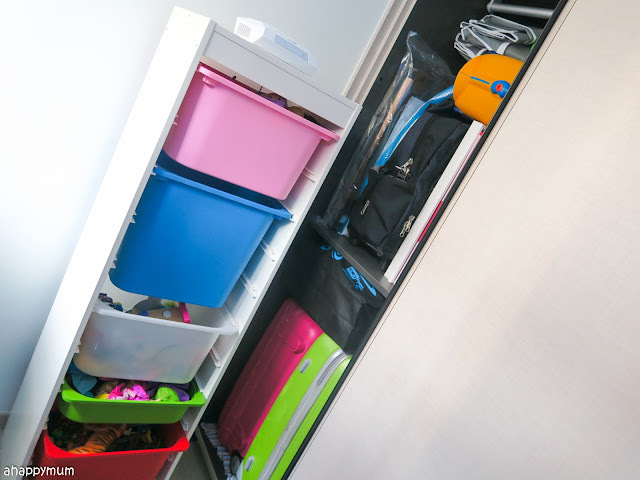 I refused to make it a storeroom per se because I foresee that once you start, you can't stop and I'll only be tempted to keep putting more things in it. So nope, it still has to look like a bedroom and be able to function like a bedroom at the snap of a finger so that we can transit the boy when the time comes. Just like the pink one, this room is cosy, small and merely takes up 8sqm of space. Yet, you'll be surprised at how much things I managed to put into it without making it look like a huge mess! Are you ready to join me on the tour today? Let's go! Now, first and foremost, I wanted to get a nice, comfy bed for the boy. If you saw the triple deck bed we have from Kids Haven in the pink room, then you will see that I love to personalise their furniture and make it as unique as can be. 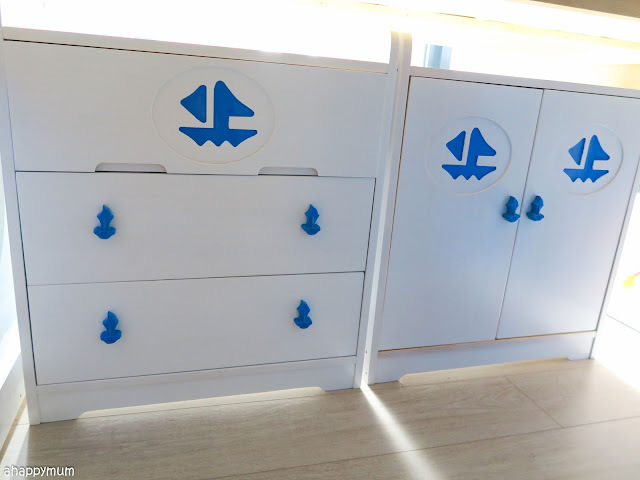 For the blue room, I wanted a Nautical theme since the boy is a sailor's son after all and I thought it would be most befitting for him. So, it wasn't a pure coincidence that I chose the colour called Nautical Breeze ME026 for the feature wall. 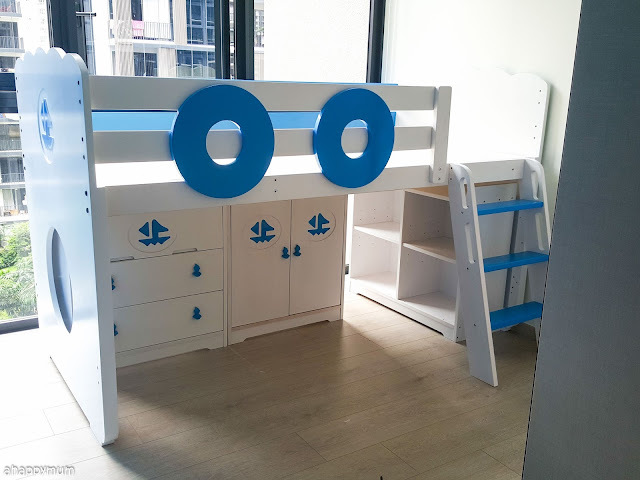 As for the bed, I chose to go with a loft bed style that has a combination of bed frame, cupboards and shelves that are blue and come with designs of boats and lifebuoys to suit the nautical theme. See the picture above? 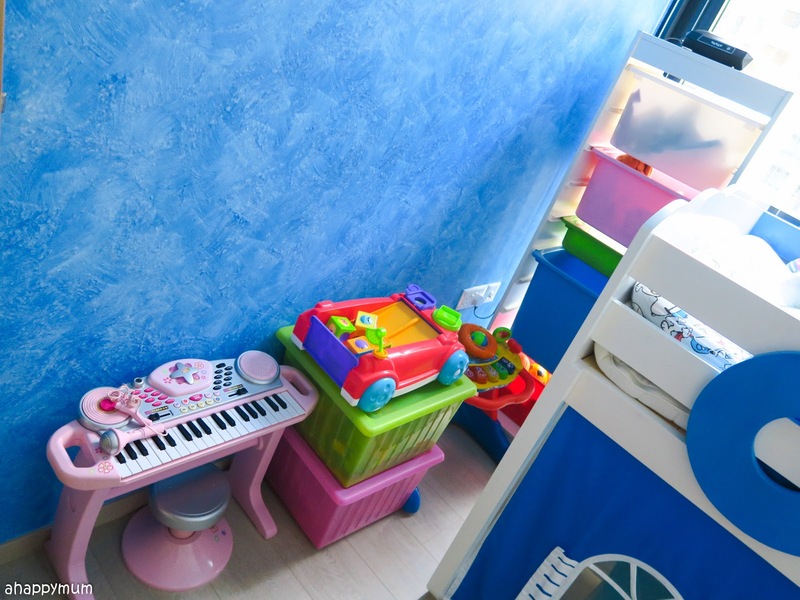 The ladder lets you climb up to the raised bed, the cupboards and shelves provide storage space and there is still some space left to function as a play area. I wanted to make it look more fun and decided to get a canopy and bed curtains too so that the kids could play camping here. Good idea, right? 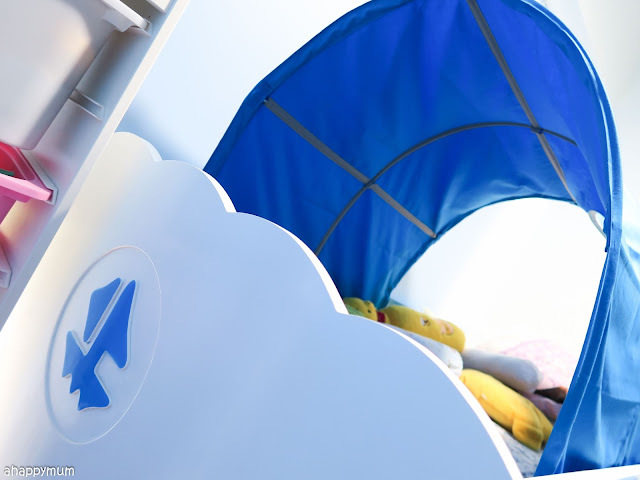 I'll be sharing in detail about the bed in my review of Kids Haven next week but here's showing you just how the room looks like in the end. Ta-dah! You like it? I love the splash of colours! The blue bed, the blue wall, the blue blinds (read our review of Meridian Curtains & Furnishings here), the TROFAST storage series from IKEA, the colourful boxes, the pink piano and more. And isn't the bed curtain with the door and windows just so cute too? Here is a closer look at the cupboards beneath the bed. I simply love the boat motifs and the cute knobs (never mind that they are harder to pull than usual). 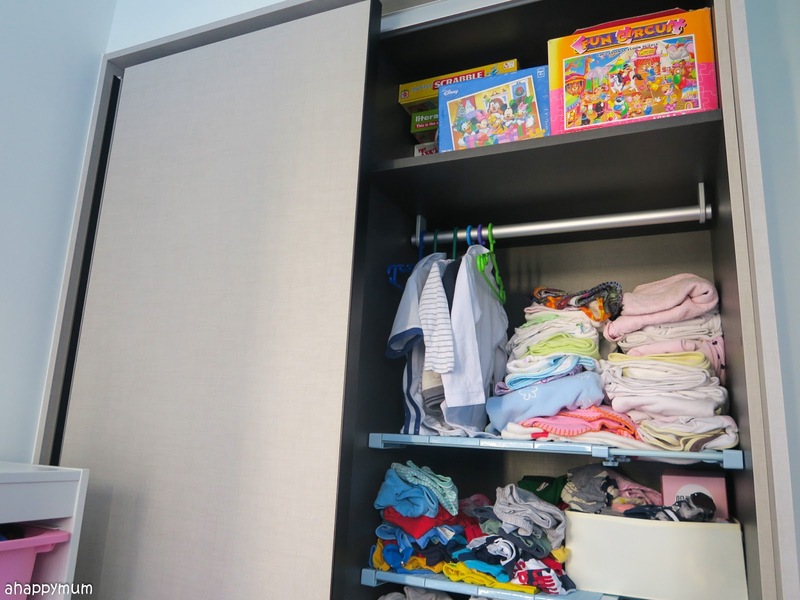 These cupboards provide the space for bulky toy items like their Sylvanian sets or toys that I don't want the baby to reach easily. I'll show you more in our review post too! It took me quite a while to figure it out as I fixed up the canopy and curtains on my own during wee hours one night. I had to do and re-do it till I finally got all the necessary tools - tension rods, thumbtacks and velcro tapes - in the correct places and were able to fully support the canopy and curtains. Like all the other bedrooms, this one comes with a wardrobe that has two sliding doors. Similar to what I did for the girls, I added blue dividers bought from Taobao to create additional shelves inside the wardrobe. I can't even tell you how handy these are and easy to screw in place too. Even if the boy doesn't sleep here for now, all his clothes and towels are kept here already (just because I don't have any space to keep them in my own bedroom). 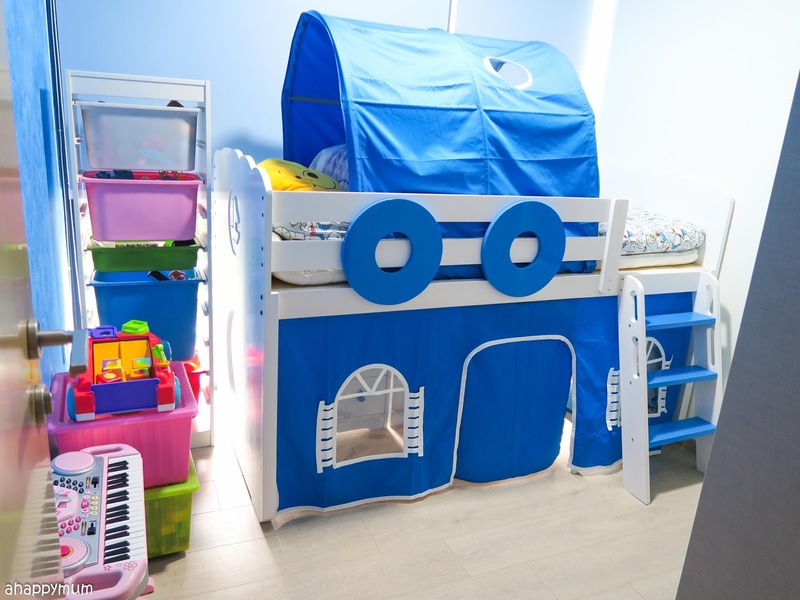 Now, I do use this room as a storeroom in the sense that the wardrobe, besides housing the baby's clothes, is also where we put our luggage, toys, picture frames, artworks, tent and more. Well, at least everything is nicely concealed, right? And oh, you are not seeing double, we have not one but two TROFAST storage frames which come with the bright, colourful boxes. Yup, the kids definitely have more than enough toys for now and I hope to make it a point to declutter and encourage the kids to donate so that others can find joy in playing too. So, that's all for now for the Blue Room. Simple and small but full of surprises. I really hope the boy will love his room next time and that we can all have fun playing here and making memories as a family too. Till the next post where I will show you more of their study area! I loved your surprised as Blue room also read the colour review of Nippon paint which is Momento Special Effects Paint and looks so classy. I also love blue colour which is also sign of professionalism. 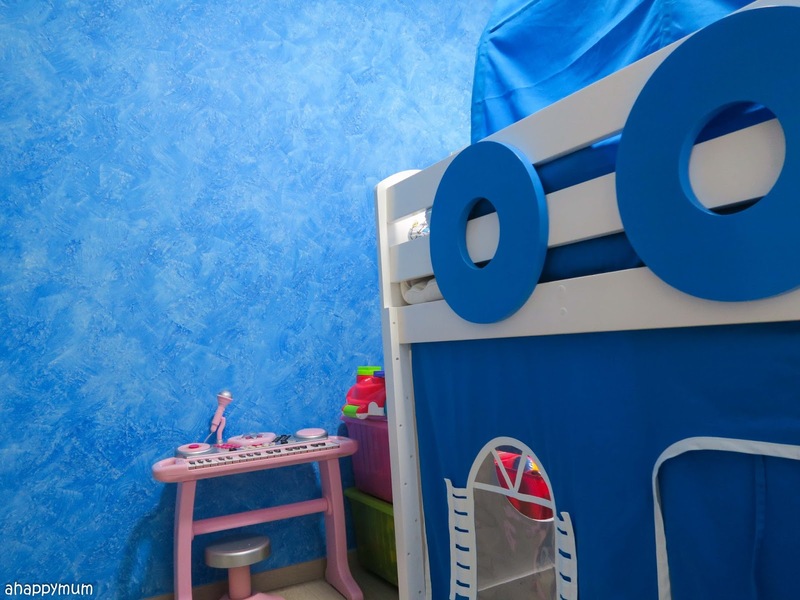 And the small baby room is looked so pleasing and what a lovely concept of designing a baby room. However I am educational consultant and assignment writer at Quality Dissertation and have many years of experience in providing assignment writing help UK in this field. I have been also doing freelancing sometime. And being as lady, I have to share this amazing blue room with my lovely lady fan club, I am sure they will also love it.